and Molly Moo Cow. Other than a brief and currently defunct series of Fanny Zilch "mellerdramas", the closest thing he'd had to a star by the middle 1930s was tired old Farmer Alfalfa, who went back to the days of Dinky Doodle and Col. Heeza Liar, and wasn't overwhelmingly interesting even then. In 1936, Terry took steps to develop something else by introducing Kiko the Kangaroo. Characteristically, he came up with Kiko after there was already another cartoon kangaroo to "inspire" him. Disney's Mickey's Kangaroo, which had come out April 13, 1935, concerned the protagonist being unexpectedly gifted with a pet kangaroo, from a friend in Australia, and the antics that ensued from that. Terry's Kiko the Kangaroo (aka Farmer Alfalfa's Prize Package), released July 31, 1936, was also about the protagonist unexpectedly being given a kangaroo, only the protagonist was good old Farmer Alfalfa, and the gift giver was his brother Hank, whom the viewers had never heard of before. Not surprisingly, Kiko turned out to be fun-loving and mischievous, and capable of everything Sylvester Pussycat's antagonist, the "giant mouse" could do to entertain an audience. He wasn't exactly a blockbuster hit, but he was well enough received to star in another cartoon, Kiko & the Honey Bears, a few weeks later, and another, Kiko Foils a Fox, after that. Altogether, ten Kiko cartoons were made, ending with Kiko's Cleaning Day, released September 17, 1937. One of them, Ozzy Ostrich Comes to Town, introduced another proposed series character, but that one went nowhere. Decades later, in an interview, Bill Hanna, one of the principals of Hanna Barbera, referred to a proposed 11th Kiko cartoon. He'd storyboarded it early in his career, when he worked briefly at a succession of studios, including Terrytoons, before settling down at MGM, where he co-created Tom & Jerry. But Terry rejected the story, and that was the end of Kiko the Kangaroo. Kiko was long gone by the time Marvel Comics became the first to license the Terrytoons characters for that medium, and thus never was adapted into anything outside of cartoons. 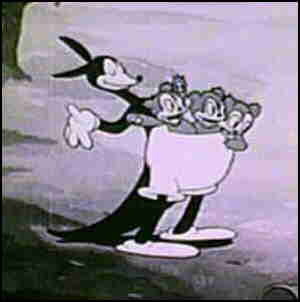 But he was part of the Terrytoons cartoon package that appeared on early television. But when TV switched to color, Kiko, who had appeared only in black and white, was left behind. Text ©2009 Donald D. Markstein. Art © Viacom.